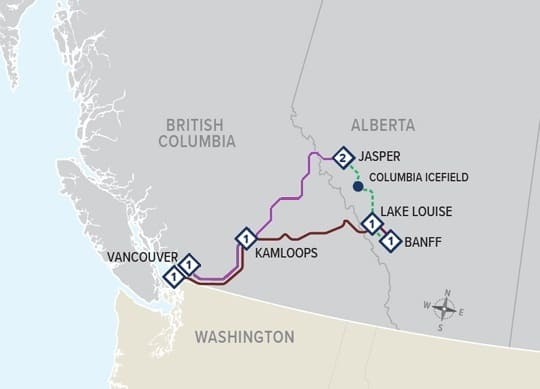 *In 2019 this package becomes a 8 Night package with an additional night of accommodation in Vancouver the night prior to boarding the Via Rail Train. The Complete Canadian Rockies package in 2019 starts in Vancouver each Monday and Thursday from April 25 until Oct 7, 2019. You’ll spend a night in Vancouver before boarding the ViaRail train for your train trip to Jasper National Park departing Vancouver at 12:00 Noon. Spend all afternoon and a night on the train in a private bedroom and wake up as the train travels through the diverse scenery of British Columbia’s interior with its rugged mountains, rivers, ranch lands and lakes. The train arrives in Jasper National Park at 8:00AM the following day. Before it does, you’ll have time to explore the train and enjoy the spectacular scenery of Canada’s Rocky Mountains. The train has, besides your private bedroom, a lounge, club car and one or more observation cars. Breakfast, lunch and dinner are included in the dining car. You’ll spend two nights and two free days exploring Jasper. There’s a lot to see and do in and around Jasper. Our favourite Jasper activities include a visit to the Jasper Tramway that goes to the top of Whistler’s Mountain, a visit to Mt Edith Cavell and the Angel Glacier, and a tour to Maligne Canyon and Maligne Lake. Let us help you make the most of your free time in Jasper. 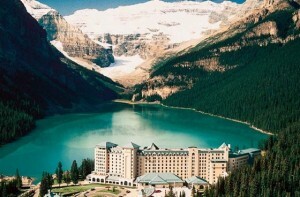 From Jasper, you will tour to Lake Louise along one of the most spectacular highways in the world, the Icefield Parkway. You’ll see turquoise lakes, mountain peaks and many glaciers. You’ll also stop at the Columbia Icefield and ride one of the giant Ice Explorers onto the Athabasca Glacier where you can walk on the ice and drink melted glacial water. In the afternoon, you’ll reach the Chateau Lake Louise with its own turquoise lake and its own glacier, and you’ll spend the night at the Chateau in a room with a view that may be the best in the world. After lunch (not included), board your tour bus and head to Banff, 35 miles away. En route you will visit Yoho National Park and Emerald Lake. You’ll spend the night in the picturesque town of Banff and the following morning you’ll board the Rocky Mountaineer train for your two day train trip through the Canadian Rockies and back to Vancouver. You’ll spend a night in Kamloops, small town in the BC interior, en route. Your package ends with a night in Vancouver. For a longer circle tour of the Canadian Rockies, see the Golden Circle.